In Praise of George W. Bush….? Ever read Maximum City? It’s one of the best non-fiction books I’ve read in decades. It’s about life in Bombay (Mumbai). I had the pleasure of meeting its author, Suketu Mehta, a couple of years ago in Ottawa. There, we talked about a scene in the book in which Suketu is given “one hit for free” by the leader of India’s biggest organized crime syndicate. That’s right: he’s got a coupon for one free assassination. When asked to whom the crime lord should turn his attentions, many thoughts in the room flirted with members of the outgoing Bush administration. Fast forward to 2009 with Bush gone and the saviour Obama in his place. Much has been expected of Obama and, I must say, the fellow has not quite delivered. This is particularly true for US involvement in global health and development initiatives around the world. So it was with great interest that I invited superstar epidemiologist Ed Mills to give a guest lecture in my 4th year global health class this past week. I knew Ed would drop the following bombshell on the students, that no one has done more for HIV/AIDS victims in Africa than one George W. Bush. The man is a hero in sub-Saharan Africa. And while Obama has personal, familial, political and racial connections to Africa, the current President has actually dialed back some of Bush’s more impressive accomplishments in the region. As summarized in this blog post, it was largely through Bush’s PEPFAR program (President’s Emergency Plan for AIDS Relief) that he effected what appears to be widespread positive change. Apparently, after a $15 billion investment, the AIDS mortality rate in 12 of the 15 targeted PEPFAR countries (the other 3 were outside Africa) declined by 10.5% over 5 years. Here is an African voice singing similar praises. How did Bush achieve this feat? Mostly by allowing his investments to focus on ARV (anti-retroviral) access. There are all sorts of barriers to poor HIV stricken people accessing these life-extending drugs, some of them valid and others less so: patent protection driving up drug prices, distribution challenges, lack of trained personnel to dose them accordingly, suspected poor adherence to the drug regimen, poor food quality diminishing the drugs’ ability to be absorbed, the inability to store them long term in a tropical climate, local corruption preventing free and easy access, and so on. PEPFAR funding, it seemed, succeeded to some extent in overcoming these barriers. But hold on…. is all this praise really well founded? It’s based, after all, on the assumption that declines in AIDS mortality rate have to do with PEPFAR monies. Leaving aside the always present problems with assigning causation, are the mortality data even accurate? I don’t know. But Mead Over seems to think they are not. As Over details in this article, the mortality data used to pronounce the glories of PEPFAR were based on UNAIDS projections. This is a widely performed and acceptable strategem, since such data are slow to return. However, Over suggests that in this case the data are inappropriate for evaluating PEPFAR success. Then there are ethical issues with PEPFAR in general. The conditions for receiving PEPFAR money include the inclusion of abstinence as a pillar of prevention and refusal to fund needle-exchange programs. Both conditions were lifted in 2008, but after years of implementation. In addition, PEPFAR only funded branded drugs, rather than cheaper generic drugs, but started allowing the latter after 2005. Full criticism of PEPFAR is available here, and an easy to read description of PEPFAR can be accessed here. Obama is continuining the program, but with a few changes. So what’s the bottom line here? 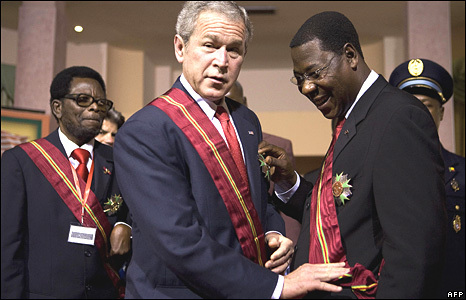 Is George Bush the saviour of Africa? Well, I don’t think it’s wrong to acknowledge that the man seemed to care a fair amount about the plight of HIV victims in Africa, and managed to push through policy directives which, while flawed and beset with ideological caveats, nonetheless managed to improve the lives of tens of thousands of people. For that, he should be applauded. But let’s not forget that Bush also disassembled many civil liberties domestically, pushed his nation into the deepest debt it has ever seen, started two fruitless wars, invaded a country that posed no threat to him or his people, lied repeatedly to his citizens, and, according to at least one study, is responsible for the deaths of half a million Iraqi children. Give the devil his due. But let’s not ignore the horns.